Lahnsteinite: Mineral information, data and localities. It was named after the town of Lahnstein, which is close to the Friedrichssegen Mine. Chemically related to namuwite and osakaite; may originate as a dehydration product of osakaite. Natural analogue of trihydrate zinc sulfate. perfect micalike cleavage parallel to (001) and imperfect cleavage in a few directions nearly perpendicular to (001). Oxidation zone of quartz-siderite veins. Gypsum 2 photos of Lahnsteinite associated with Gypsum on mindat.org. Pyrite 2 photos of Lahnsteinite associated with Pyrite on mindat.org. Devilline 1 photo of Lahnsteinite associated with Devilline on mindat.org. Ktenasite 1 photo of Lahnsteinite associated with Ktenasite on mindat.org. Bear, I.J., Grey, I.E., Madsen, I.C., Newnham, I.E., Rogers, L.J. (1986): Structures of the basic zinc sulfates 3Zn(OH)2•ZnSO4•mH2O, m = 3 and 5. 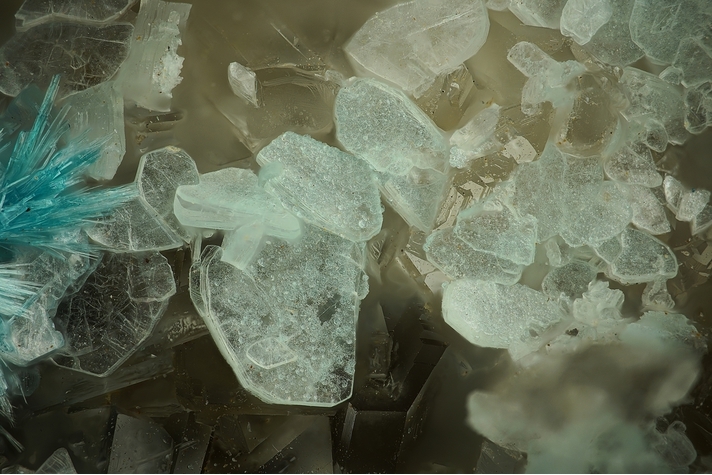 Acta Crystallographica, B42, 32-39. Chukanov, N.V., Rastsvetaeva, R.K., Aksenov, S.M., Pekov, I.V., Belakovskiy, D.I. 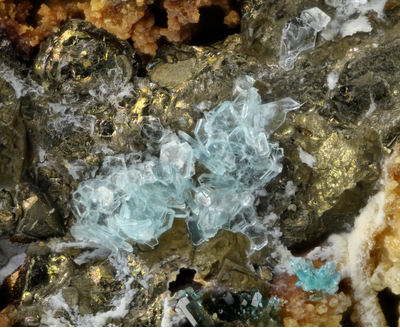 , Blass, G., Möhn, G. (2012) Lahnsteinite, IMA 2012-002. CNMNC Newsletter No. 13, June 2012, page 813; Mineralogical Magazine, 76, 807-817. Rastsvetaeva, R.K., Aksenov, S.M.,Chukanov, N.V., and I. A. Verin (2012): Crystal Structure of a New Mineral Lahnsteinite, Zn4(SO4)(OH)6 · 3H2O. Kristallografia 57(5), 820-824. Kolitsch, U., Rieck, B., Brandstätter, F., Schreiber, F., Fabritz, K. H., Blaß, G. & Gröbner, J. (2014): Neufunde aus dem altem Bergbau und den Schlacken von Lavrion (I). Mineralien-Welt 25 (1), 60-75 (in German). 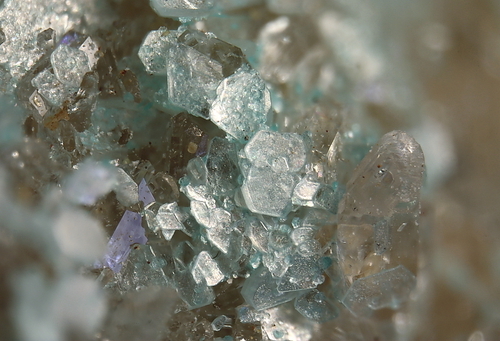 Originally obtained as "goslarite"; visually identical material was SXRD-analysed by Uwe Kolitsch. For details see Kolitsch, U., Rieck, B., Brandstätter, F., Schreiber, F., Fabritz, K. H., Blaß, G. & Gröbner, J. (2014): Neufunde aus dem altem Bergbau und den Schlacken von Lavrion (I). Mineralien-Welt 25 (1), 60-75 (in German).